Dragon Quest XI: Echoes of an Elusive Age tells a captivating tale of a hunted hero and is the long-awaited role-playing game from series creator Yuji Horii, character designer Akira Toriyama, and series composer Koichi Sugiyama. 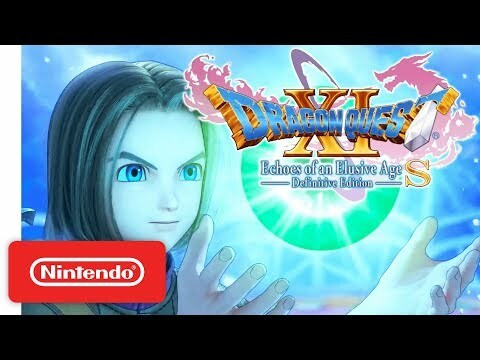 As the eleventh mainline entry in the critically acclaimed series, Dragon Quest XI is a completely standalone experience that features entirely new characters, a beautifully detailed world, finely tuned turn-based combat, and an immersive story that will appeal to longtime fans and franchise newcomers alike. The upcoming Dragon Quest XI: Echoes of an Elusive Age Switch release date is Q4 2019 in the US and the UK. Notify me when Dragon Quest XI: Echoes of an Elusive Age Switch is available. Is Dragon Quest XI the First Confirmed Nintendo NX Title?